I've been trooping with my Hyperfirm E11 for a while now, and have been very happy with it. Without getting into the details, it's definitely sad that Hyperfirm blasters are no longer made, since HFx Productions is no more. Somewhat on a whim, I decided to snap up a blaster from Praetorian Blasters, to see how they compare to my Hyperfirm. I got it a few days ago (a little under 3 weeks from ordering, IIRC), and snapped a few photos to compare to my Hyperfirm. Sorry all the angles aren't perfect, but I was in a hurry and had no extra helpers. 1) Yes, my Hyperfirm is a *b-grade*. But it's a pretty solid B-grade, with almost no defects... I'm a bit surprised it wasn't rated higher. That said, the "main" mold lines tend to be a little cleaner on the higher-grade models, because they spend more time cleaning them up. So don't judge that comparison quite as harshly as you otherwise might. 3) One thing that doesn't show up in photos: Weight. The PB is noticeably lighter than the HFx. We're not talking Rubies levels of featherweight, but definitely lighter. That'll likely be both a pro and a con. The weight of the HFx just "feels" perfect in the hand. The PB feels notably more "fake" in your hands, by comparison. OTOH, it'll be nice to have a lighter blaster on long troops, or when it's holstered. One of the few issues I have with the PB: I wish the trigger was cut out more, behind it, as the HFx is. I might try to do this, myself. One area PB falls shorter, IMO, is the rail that the scope is mounted on. While technically the rail itself seems more accurate than Hyperfirm's, it's filled with a pretty solid chunk of rubber. The HFx rail is way less accurate... and ALSO filled in. But the fill is very small and very thin, and as you can see, I cut mine out in the front and back (left it under the scope where it's hidden behind the Hengstler counter anyway, for extra stability), which I think was a distinct improvement. I don't know, at this point, if that would be possible with the PB blaster. You'd see a lot more cut rubber under the rail, since it's higher. And just as one final pic that didn't fit anywhere else, I just love this detail shot, of the PB. SO CLEAN!!! I have a PB E-11 and have been very happy with the quality. I agree about the scope rail - their R1 E-11 has a hollow, real metal scope rail which I'm very jealous of. If they bring that over to the ANH I would be very tempted to upgrade. If they bring that over to the ANH I would be very tempted to upgrade. That probably won't happen considering it's not screen accurate. That said you can always buy the scope kit and add it yourself . I meant an accurate (metal) rail, but yeah, I suppose I could... though I'd probably mangle the blaster. Agreed, if they had a metal rail on this thing (similar to how they do on the R1 version), I'd be overjoyed. When you guys say metal rail are you referring to the mount? 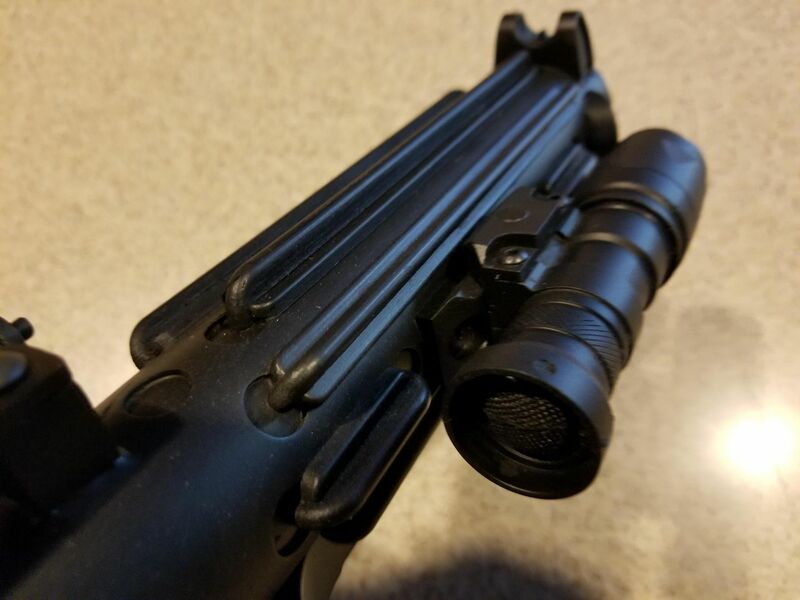 No, not the "tactical flashlight rail", just the scope rail. We're referring to the metal (normally) rail that the M19 scope is attached to, running along the top. The scope should be mounted to a thin metal rail, like one of those above. You should be able to see light between the rail and main tube/body of the blaster. On both the Hyperfirm and PB blasters, they mold that rail out of rubber (instead of being metal), and connect it all the way to the body, underneath, so you can can't see under it. Had light on the brain. They're both "rails", technically, so you get a pass. Time for a refreshment lol. Since I'm on the correct page now maybe this is something we can suggest to PB. The R1 rail is a bit too tall for ANH, but that should still be a really simple change for them. I'd think.